The mirrors occupying the wall reflect children’s emotions prosaically: happy smiles when they succeed, chagrined faces when they fail, and sometimes sulky eyes. This is a dancing school held on Sundays. It is located on the third floor of a multiple-tenant building in Obama, Fukui Prefecture. “Children are great. They absorb anything,” said Kiyoto Takada, 29, the instructor. He works there for a very low amount of money because he is happy to see the development of children. Kiyoto’s day job is a worker at the nuclear power plant in Ohi next to Obama. He joined a local company which maintains intake pumps at the powerhouse four years ago. He could not believe his eyes while watching TV news that day when Fukushima No.1 Nuclear Power Plant exploded. 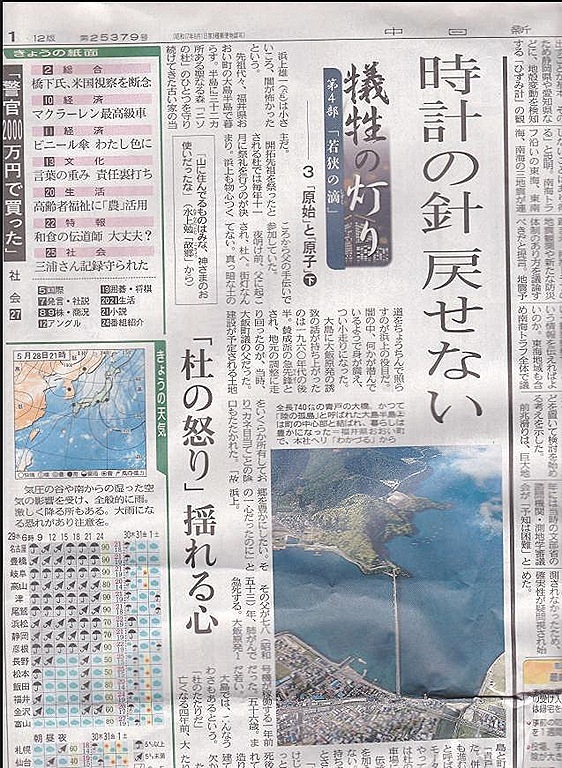 “What if the same thing happens?” Ohi Nuclear Power Plant is located on the sea. Fear of tsunami went through his mind, but disappeared soon. The accident was something far away for him. “No Nuke!” After the disaster, the public mind went to the antinuclear power movement, and all of the nuclear power stations in Japan stopped working in May last year. Since then Kiyoto sometimes worked at a thermal power generation instead of the nuclear power station. He became anxious. “What will happen in the future?” That was why he was relieved when the government decided to restart Ohi Nuclear Power Station one month later the suspension. “No Resumption!” Anti-nuke people were shouting at the gate of the power station that day when Ohi No.3 and No.4 Reactors resumed. But there were no local people who Kiyoto knew in the group. “They’re just outsiders.” Kiyoto thought that when he was heading for the station by car through those protesting people. “We need nuclear power stations.” Because he believes that, he feels anxiety about the existence. 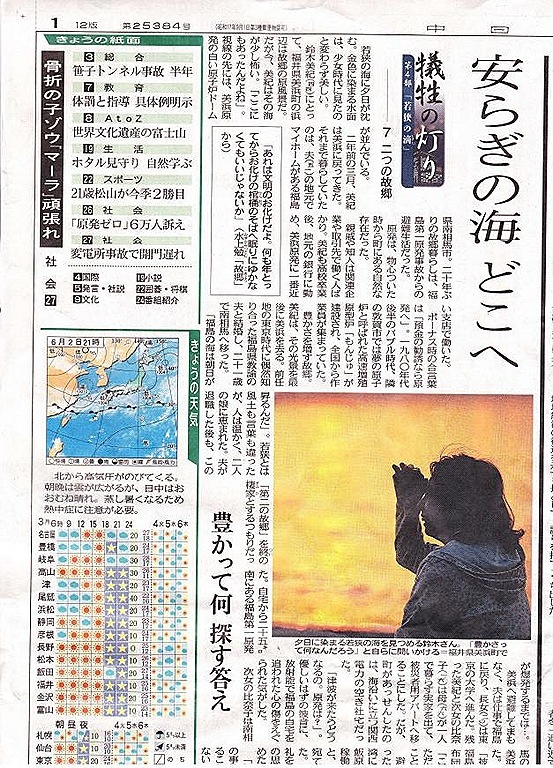 He noticed by the accident in Fukushima that there was no guaranty of the nuclear power plants’ permanent continuation. Most of the villagers would have to let go of their rich lives if they lost the nuclear power station. How would the village be after the children grow up? Kiyoto thinks about his village’s future when he sees those dancing kids. He is now holding back fear in loud music. 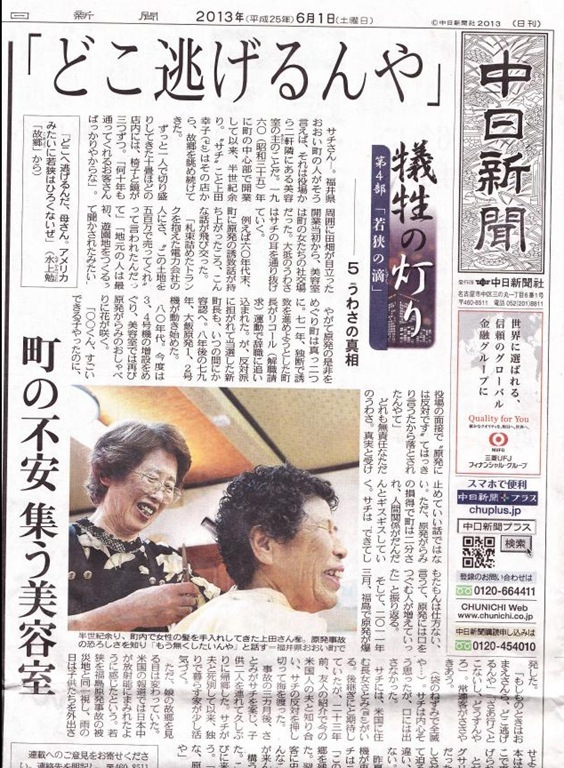 Sachiko Ueda, 77, is called Sachi by everyone in Ohi-cho, Fukui Prefecture. She has run a small hair salon for a half century since she started it in 1960. She has seen her hometown there. The tiny shop has just three chairs and three mirrors. Her place has been a place for social interaction for local women. Sachi hears most of the rumors there. In the end of 1960s, for example, when a plan for the construction of a nuclear power plant was brought to the village, she heard these rumors: Someone was asked for selling his land for 5 million yen by an employee at the electric power company with wads of cash; Some local people seemed to think their lands would become a big theme park or something. Later the village was divided into two by arguing the pros and cons of the construction of the nuclear power plant. The mayor of the village tried to advance the project at his own discretion in 1971, but he was de-elected. The new mayor who had been supported by the anti-nuke people, however, turned to support the plan after the election. Ohi No.1 and No.2 Nuclear Reactors started in 1978, eight years after the recall election. When the nuclear accident occurred in Fukushima in March, 2011, regular customers muttered each other, “Where are you going to run away if the same thing happens here?” “Well…I have no idea…” All of us would die… Sachi thought that, but didn’t say that. I heard even beating wings of a kite which was flying in the air. There was a wooden building covered with ivies before me. “That used to be an elementary school.” A farmer who was planting rice in a rice terrace nearby said that and wiped the sweat. He is Akio Taniguchi, 72. “Most of the adults in this area studied there.” It was a prewar elementary school building for children who lived in the heart of Mt. Aoba in Takahama-cho, Fukui Prefecture. Tsutomu Mizukami, who was a novelist and was from Ohi-machi next to Takahama-cho, used to be a teacher at the school for two years from 1944, when the war was near to end. He taught some 30 students who were from the first to the fourth grade there. He evacuated from Tokyo, where there were many air raids, and got a job as an assistant teacher near his hometown. After coming back to school, Taka-chan showed a special skill. When children had to gather food for soldiers, she went deep into the mountains and picked lots of Japanese butterburs. 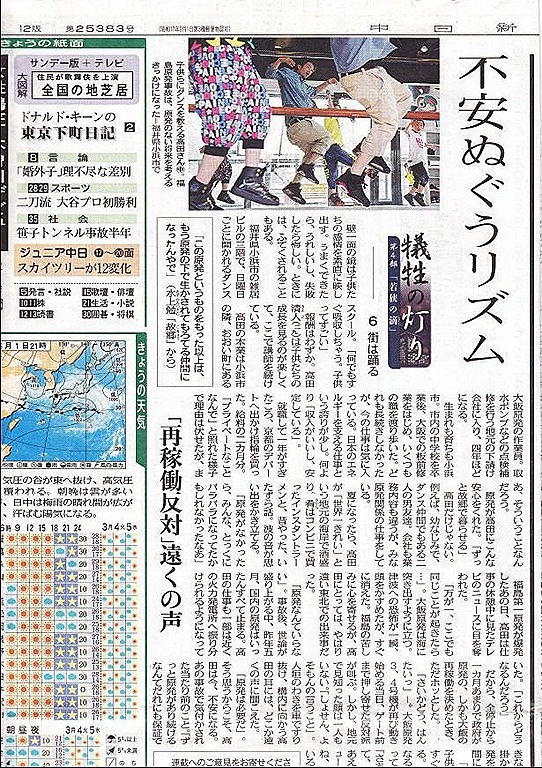 Her classmates who had evacuated from Tokyo or Osaka widened their eyes in surprise. One day, Taka-chan was missing. She went too deep into the mountains. All of the teachers and the students searched her and the children shed tears of relief when they found her. After the war, Mizukami wrote this: Under the sunset, the tearing children were beautiful. Mizukami appeared at the school building again in the fall of 1976, after he had achieved success as a writer. Ex-students of his held a class reunion. Akio remembers how his sister was that day. “She welcomed him at the school gate with her mother. She is smiling as she used to be with her teacher on a photo.” At that time, the village was changing dramatically. Two years before the class reunion, the first reactor of Takahama Nuclear Power Plant, which was 4 kilometers north of the school, started. After that, the construction of the power station was continued, and totally four reactors were built. Akio left his rice fields up to his wife and parents, and worked at the construction. “I’ve ever worked there for 24 hours straight.” It seemed that the nuclear power plant was the strongest architecture in the world to him at that time. He does not deny that the nuclear power plant has given richness to the villagers still now. The old school was closed in 1983 when a new building with reinforced concrete was built near the old one with government subsidies. But Akio has often thought, “We’ve had enough…” since he saw exploded Fukushima No.1 Nuclear Power Plant on TV. Even after the village got a nuclear power station, young people have kept leaving their hometown to urban areas. The scenery of rice terraces is beautiful, but most of them exist just as tourist attractions. Taka-chan passed away eight years ago at the age of 67. It was just a year after Mizukami’s death. Until the end of her life, Akio’s sister had carried that old photo all the time with her. Today, there is no child to go to the school with reinforced concrete. Yuichi Hamagami, 65, was scared of the dark when he was a child. His family has lived in Oshima Peninsula, Fukui Prefecture, for generations. The Hamagamis is the guardian for one of 32 sacred forests called “Niso-no-mori” in the peninsula. There is a festival for their ancestors who broke in the area in each forest every November. Yuichi has joined the festival since he was a little child to help his father. Before dawn, little Yuichi was jerked from slumber by his father and went to their forest. There was no street lamp. Yuichi’s role was holding a paper lantern in the darkness. He could not help running because he thought he was seen by something from the darkness. “I don’t believe rumors, but I kind of feel creepy.” After his father’s death, Yuichi built a small shrine in the forest, where there had been just a sacred stone. Besides he has held every rite. But he does not think it is the fault of the nuclear power plant if his father passed away from a curse. Yuichi became a town councilor like his father after he was retired from the town office. He said, “People’s will is in resuming!” in a conference about Ohi Nuclear Power Station’s restart last July. Of course, perfect safe control is precondition for his statement. He says, “Our wish to enrich our hometown is almost fulfilled. We can’t turn back the clock now.” The village has a handsome bridge and smooth roads. Streetlights shine at night. Yuichi is no longer afraid of the dark. 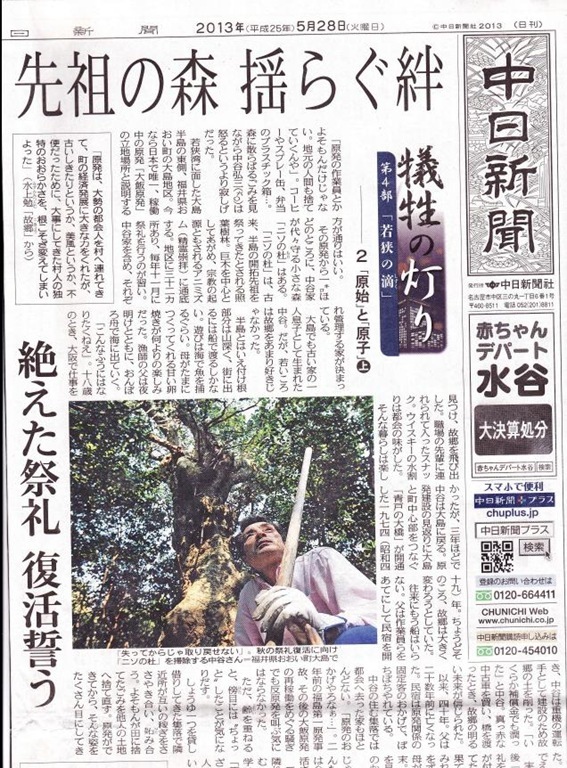 Koji Morishita, 56, is also one of the guardians for the sacred forests “Niso-no-mori”. He runs a guesthouse for workers related to the nuclear power plant. He used to reply, “Our lives are also important,” to the questions connected in the powerhouse. But he never forgets the sight in Koriyama, Fukushima Prefecture. He visited there to look at the actual circumstances in the devastated area. He saw children playing in an indoor recreation hall in the town. They looked happy. But he was shocked by the guide’s explanation: Children haven’t been able to play on the ground outside for fear of exposure since the nuclear power plant caused the accident. “I’d never thought of that. I was very shocked that I had never thought of that…” Now Koji hesitates to the pros and cons of nuclear power plants. He cannot answer to the question whether his village needs the facilities yet. He just thinks “God in our forests will get mad if an accident happens in the nuclear power plant. “Not only strangers like workers in the nuclear power station but also local residents litter.” Empty cans and plastic packages… Staring at litters in the forest, Kozo Nakatani, 60, looked sad rather than angry. Oshima is located in the east of Oshima Peninsula facing Wakasa-wan Bay in Fukui Prefecture. This is the only place where a nuclear power plant is in operation in Japan now. There is a small forest called “Niso-no-mori” about one kilo meters from the power station. The Nakatanis is the guardian of the forest for generations. “Niso-no-mori” is an evergreen broadleaf forest, where ancestors who exploited the peninsula have been ensured since ancient times. It is a kind of animism, in which people worship big trees as holy. There are 32 such sacred places in the area, and people hold a festival there in November every year. Each place has a guardian like the Nakatanis. The Nakantanis is one of the oldest families in Oshima Peninsula. Nakatani did not like his home very much when he was young. People just went fishing in their leisure time. They had to use a boat to go to downtown. The happiest time for little Nakatani was eating sweet rolled eggs that his mother cooked occasionally. His father headed out to sea by his rickety boat at first light. “I don’t want to be a man like my father!” Nakatani ran away from home and went to Osaka when He was 18 years old. When he was taken to a pub by his co-worker and sipped whisky with water for the first time, he thought it tasted urban. He was enjoying city life, but he went back home three years later. It was in 1974, when “Aoto-no-ohashi”, a bridge connecting Oshima Peninsula and downtown, was built in exchange of construction of a nuclear power plant. His hometown was about to change a lot. People did not need to use a boat to go to downtown. Nakatani started working as an operator for heavy equipments to build the power station and his father opened a guest house for construction workers. He received a compensation payment and bought a blazing red car. He believed his hometown’s rosy future when he crossed the bridge by his car at that time. It has been 40 years since then. Nakatani’s father passed away some 20 years ago. The guest house is still there because of regular customers who are related to the nuclear power plant. There are few families which left for town in his village. “It’s thanks to the nuclear power station…” Nakatani says. 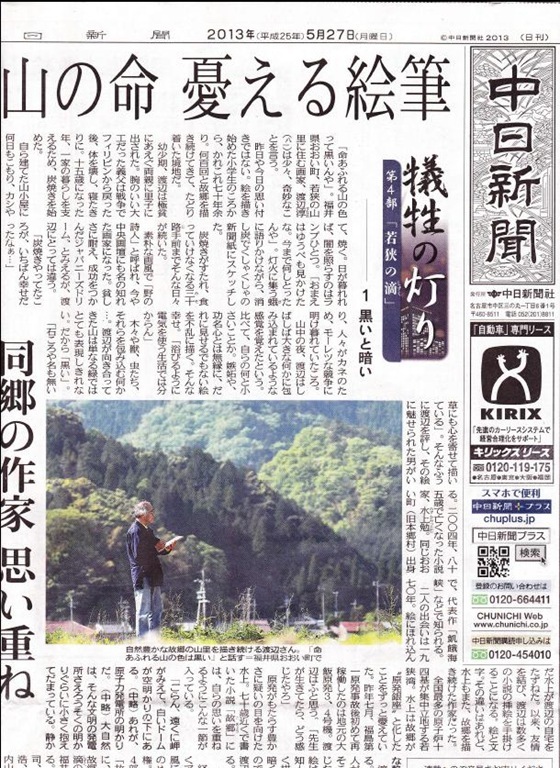 He did not join the anti-nuke movement for resuming operation at the nuclear facility in Ohi Nuclear Power Station after the disaster in Fukushima No.1 Nuclear Power Plant two years ago. But he has something “small” on his mind. People in his village used to give each other help, but now they are envying their neighbors’ income. Someone litters in a rice field, and the rice field owner throws the garbage away into other’s land. Nakatani has seen those things a lot since the nuclear power plant was built in his area. Actually, He has stopped holding a festival in “Niso-no-mori” since his father passed away. The shrine his grandfather had built was broken and surrounded by a large amount of garbage when he noticed. His mother who had been worried about that suddenly passed away at the end of last year. “Why didn’t I show her the festival?” Nakatani is feeling bad about that. He is going to hold a festival this fall. Nokatani is not only person who has a shaky mind between “nucleic” and “archaic” matters. 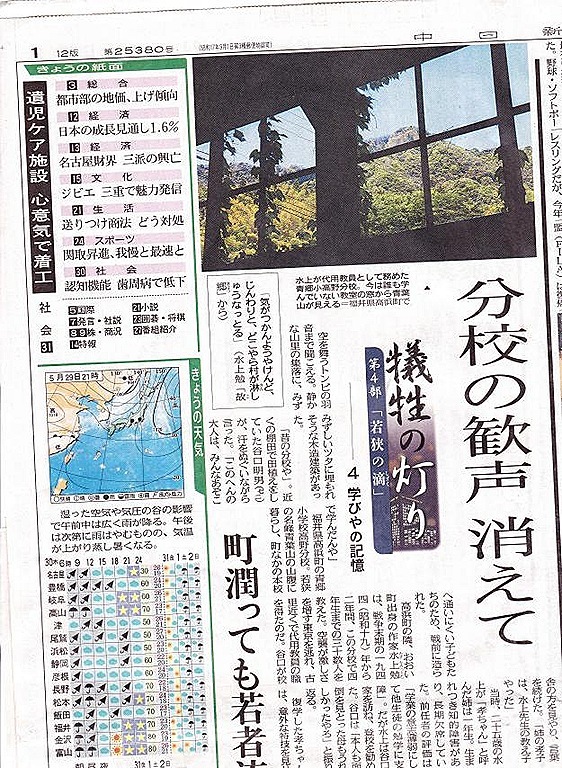 “Lively mountains are black,” said Sunao Watanabe, 81, an old painter in Wakasa (Fukui Prefecture). It might sound strange, but he has thought that for more than 70 years since he began painting when he was an elementary school child. He has depicted his home hundreds of times. Watanabe was born into a destitute family and was fostered out to a carpenter in his childhood. His foster father came back alive from the battlefront in Philippines, but since then became bedridden. Watanabe became a charcoal burner when he was 15 years old to support his foster family. He built a coal pit in the mountain and cut oak trees and made them charcoals. When night fell, it was just a small lamp to illuminate the darkness. “I didn’t see you last night. Where have you been?” He talked to moths coming to the light and sketched them on rumpled newspaper with cinders. He had lived that way until he became 30 years old when it was difficult to make a decent living as a charcoal burner. He is, however, now a well-known painter called “a poet in the mountain.” It sounds like a success story after suffering from poverty. But he says, “The happiest time of my life was when I was making charcoals…” That was an age of high economic growth when people were working like mad for money. Watanabe sometimes had a special feeling as if he was surrounded by something huge at midnight in the mountain. Then he realized his tininess and just sketched without thinking anything. It was the happiest time for him. “You can’t understand that if you live by using a lot of electricity.” The mountains which Watanabe has faced cannot be described as just green. So, he says they are “black”. “He cares pebbles and nameless weeds when he paints.” Tsutomu Mizukami, a novelist who passed away at the age of 85 in 2004, used to describe Watanabe that way. Mizukami and Watanabe were from the same village in Fukui. They met each other in 1970, when Mizukami, who had become a fan of Watanabe, visited the painter’s house. Since then Watanabe has illustrated Mizukami’s books. Painting and writing. Their means of expression were different, but both of them have depicted their hometown. Their home has 14 nuclear power reactors, which is the most all over Japan. Mizukami had been anxious about that. The third and fourth reactors in Ohi Nuclear Power Station restarted last July for the first time after the disaster in Fukushima No.1 Nuclear Power Plant. Watanabe wondered what Mizukami would have said about that if he had been alive. Watanabe understands Mizukami’s thoughts. “Nuclear power plants are made by human-being.” He cannot feel anything huge from the structures. He rarely paints the nuke plant. But lately he had to paint one because he was asked by an acquaintance. At that time he daubed the background with dark colors. It was not “black”. The surround of the powerhouse looks “dark” through his eyes.